As I’ve said before, there are certain films on my list that are not out and out Great War Films. They may not have one single frame of war stuff in them but for some reason or another they count as Great War Films, at least in my head anyway. My film today is one of these films. It’s set in the years after the war and deals with what happened to some of the heroes once the war machines wheels stopped turning. 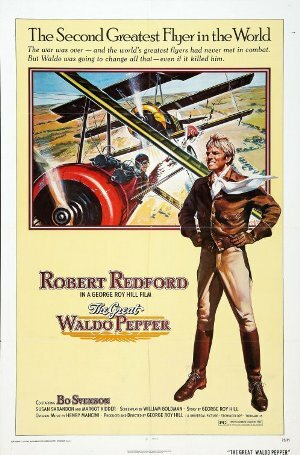 The Great Waldo Pepper (1975) is the story of the aviators who survived the war in the air and returned to civilian life needing to scratch a living with the only skills they had. It’s the story of the Barnstorming era. In the years after the Great War there was a glut of cheap aircraft sold off by the peacetime government and a raft of experienced pilots in need of a living. Add in a lack of regulation to this triumvirate and you have a situation where national heroes of old, the legends of the skies were reduced to performing stunts for paying crowds in flying circuses that toured the US. As the years passed the crowds and pay packets dwindled, as did the barnstormers as one by one they spannered themselves in flaming wrecks or when their livers exploded. By the time the Government intervened with the introduction of civil aviation regulations the few remaining battered and bruised flyers were forced to move on to other ventures or take jobs within the newly regulated industry. By all accounts this was a bit of a vanity/pet project for Director George Roy Hill (Butch Cassidy and the Sundance Kid, The Sting, Slapshot). As a pilot himself he was infatuated with the flying heroes of the Great War, the early pioneers of flight and their plight as the years passed. 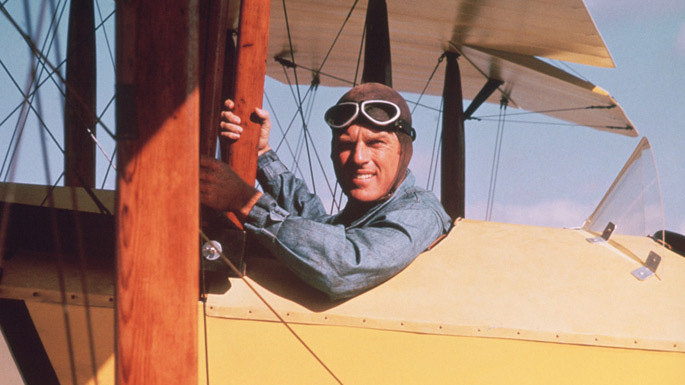 Robert Redford stars as the eponymous Waldo Pepper, a nearly man with natural flying talent. He never made it into battle, but still regales the crowds with made up tales of how he fought alongside and against some of the greats. Susan Sarandon co-stars in a bitsy role that never really gains momentum and Bo Svenson rounds out the cast with possibly the stand out performance. The story uses made up names and composite characters but Director Hill makes it clear from the outset that this is a story very much based in the real world. The opening credits feature images of some of the eras leading pilots including Ormer Locklear and German Ernst Udet including their dates of birth and death. Locklear died flying a Hollywood stunt in 1920 and Udet committed suicide in 1941 after a falling out with the Nazi party. Interesting fact about Locklear is that his girlfriend of the time, young starlet Viola Dana witnessed his fiery crash in a late night film shoot. She was invited to the premier of the Great Waldo Pepper by Director Hill in a gesture that shows his earnestness and his passion for the era. As we should expect, there are a few deaths during the course of the film. 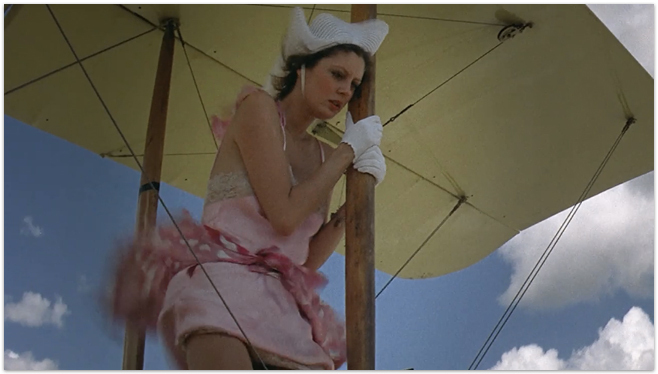 Firstly Sarandon drops off a wing into the never never after freezing during a wing walk and then just a few screen minutes later Waldo’s brother crashes his plane and burns to death. Both of these deaths come out of the blue, yes the stunts they are attempting at the time are dangerous, but this is Hollywood and I was expecting happy endings. The deaths come out of the blue and are jarring, just like in real life, I suppose. Everything is going okay and then bang out of nowhere everything changes. These moments cause the story to jump in unexpected directions, again just like life. There are plenty of aerial stunts throughout the film including an impressive plane to plane transfer by a wing walker. A plane barrels, feet from the ground down a high street and a stuntman transfers from a car to a rope ladder hung from a plane. Good stuff throughout and a hark back to the era. You don’t see stunts like this on film these days. Also worthy of mention are the planes. What amazing things they were and we see glimpses of their fragility and their wood, string and hinge controls. The final scenes attempt to pull the story to some kind of a conclusion and is the only part of the film that I feel is a bit laboured. Waldo moves to Hollywood and meets his hero Ernst Kessler (a thinly veiled Ernst Udet). They fly together to film a scene for a film. 2 other pilots have already died during the production. Once in the air they quickly abandon the scene and set off on a dog fight. Waldo keen to test himself against his hero and Kessler reminiscing and wallowing in a chivalric past. They are young again and reliving the thrill of the fight. I shan’t ruin the ending for you but I will say I felt a bit let down by it. I was expecting more of a crescendo. Again, probably just like real life.